The ULEZ is designed to improve the quality of the air you breathe in central London by cutting the number of older, dirtier cars on the roads. It’ll complement the Congestion Charge (CC) – which cut private car usage by 39% between 2002 and 2014, according to stats from the London Assembly. However, the ULEZ runs 24/7, 365 days a year rather than having the CC’s Monday to Friday, 7am to 6pm operating times. The idea is to lower the number of premature deaths – currently in the thousands – in London that can be attributed to poor quality air. Amongst other things, they’ll limit harmful Particulate Matter, NO2 and CO2 gases. Want to avoid the ULEZ and the Congestion Charge, then head over to our guide to the best exempt cars. The ULEZ is one of the ways it is hoped air quality can be brought in to check. It will operate in the same area as the CC which runs as far north as St Pancras, east to Shoreditch, south to Vauxhall and west to Mayfair. There will be no physical barrier preventing you from entering the ULEZ, instead, it will be well signposted as you approach the zone and policed by a barrier of number-plate reading cameras. It means the first time you’ll know you have been charged could be when the penalty charge drops through your letterbox. It’s a £160 fine reduced to £80 if you pay it within 14 days. Eligible cars entering the ULEZ need to pay a £12.50 charge that runs concurrently with the £11.50 Congestion Charge. The only exception goes to owners of cars registered with ‘disabled’ or ‘disabled passenger vehicles’ tax – they’ll be exempt from paying the ULEZ until 26 October 2025. London black taxis are also exempt, although any Taxi sold after 1 January 2018 has to be Zero Emission Capable – i.e. able to travel at least 20 miles on electric power alone and produce CO2 emissions of less than 75g/km. 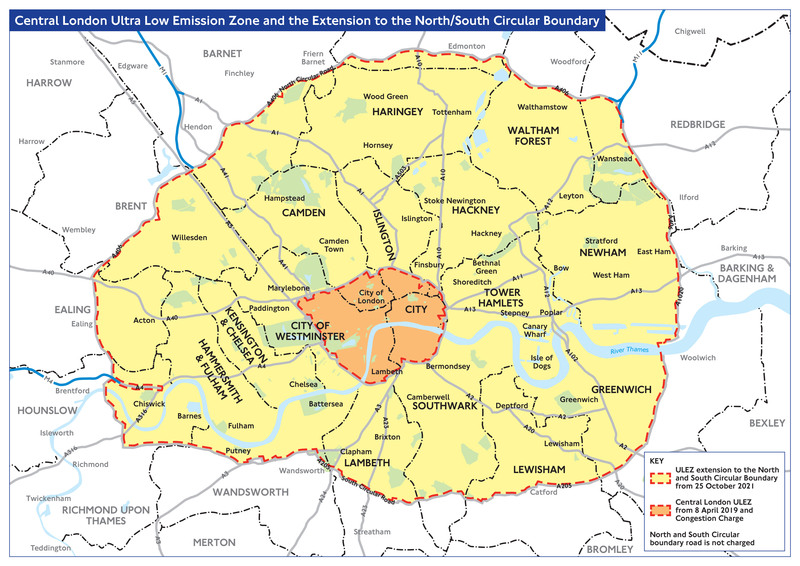 The 2019 ULEZ is just the start, by 25 October 2021 the borders will expand out of the Congestion Zone to the North and South circular – covering an area 18 times larger than the Central London Congestion Zone and affecting 100,000 cars. That’s worth bearing in mind if you live in this area and are planning on buying a secondhand car. 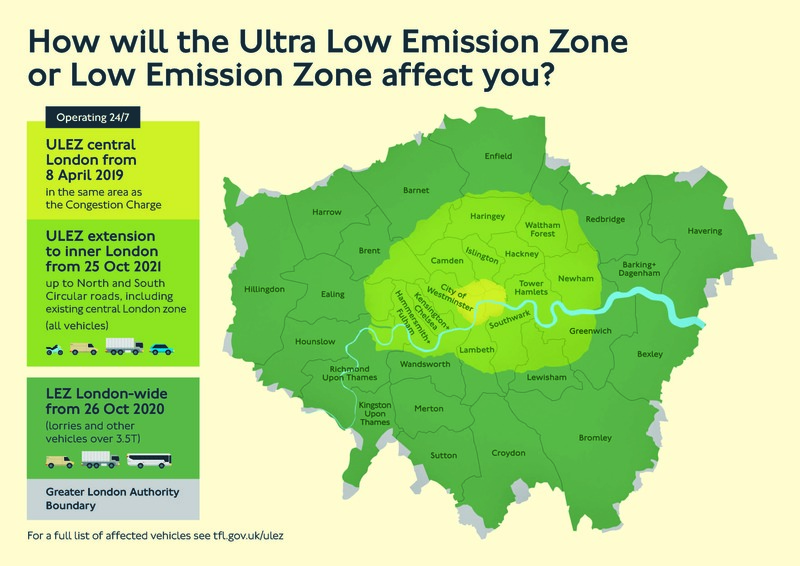 ULEZ – what petrol cars will be affected? The ULEZ will specifically target older cars with high emissions. That covers petrol cars that don’t meet Euro 4 standards that came into force in 2005, although some cars were compliant before this. The ULEZ will be much tougher on diesel cars, however, to be exempt from paying the charge, they need to meet Euro 6 standards that were only introduced in 2015.